Incorporating kids books about bullying can help children learn the warning signs of bullying and encourage them to discuss their feelings and experiences with others. The effects of bullying can be serious and affect kids sense of safety and self-worth. Teaching children the simple act of kindness and encouraging others to do the same, goes a long way. 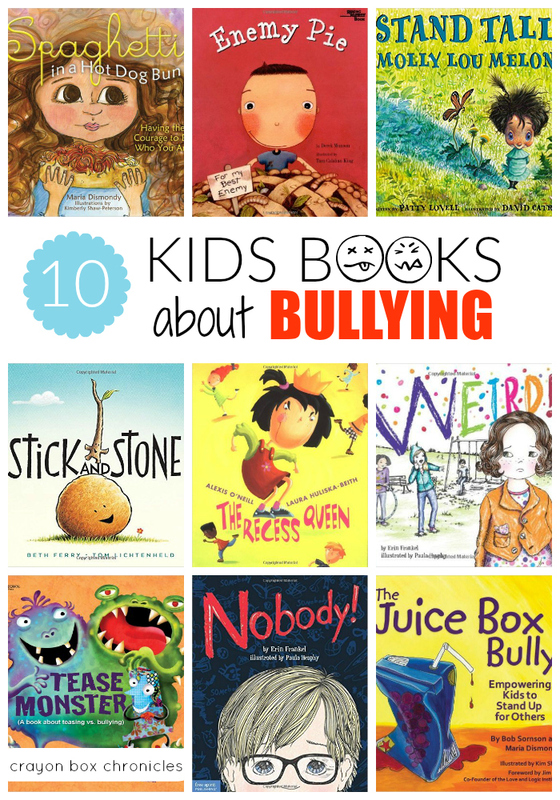 Many of these delightful books provide tools that help teach simple, effective ways to identify bullying and teach the importance of self-worth and kindness for all ages. Spaghetti in A Hot Dog Bun is a charming story that helps children understand that knowing who you are and seeking to understand the needs of others, even when they’re mean to you, makes all the difference. The main character is a girl who lives with her grandfather, who fears telling her caregiver about her encounters with Ralph. The illustrations are very sweet and engaging. Stick and Stone is a beautiful story about friendship, even where we least expect it. Stick and Stone are all alone until one day when Stick stands up for Stone against the bullying Pinecone. They become best friends, exploring the world together. The illustrations are soft and perfectly compliment the rhyming text. Stand Tall, Molly Lou Melon is about a girl in first grade with big hair, buck-teeth, and a sharp, squeaky voice. When she starts at her new school, she encounters a bully. Thankfully, her Grandma has taught her many valuable life lessons about standing tall and proud. We really enjoy this book because it sends an excellent message to children about self-esteem and the importance of inner beauty. The Juice Box Bully teaches children that they can help the bully, Pete, with the classroom “promise” rather than labeling him. They stand up for not only the kids being bullied, but for the bully himself, making it a very impactful lesson about courage, kindness, and unity. Age 4+. Howard B. Wigglebottom Learns About Bullies is a playful story about Howard the rabbit who is getting bullied by his classmates the Snorton twins. Howard has a difficult time telling the teacher that he is being bullied. The book really emphasizes the importance of kids being brave and gives readers tools to face the bully and steps to tell the teacher. Age 5+. The Recess Queen is about a bully that makes everybody follow her commands, until one day, a girl named Katie Sue, a tiny kid, saves the day. Katie asks her to play with her on the playground. The humor and illustrations are very engaging for young readers. Age 4-8 years. Enemy Pie is a charming story about a boy named Jeremy Rose who became the neighborhood enemy just by moving in. One little boy learns an effective recipes for turning your best enemy into your best friend—enemy pie. The book reinforces friendships and dealing with others in a positive way. The illustrations are bright and vivid. Age 4-7. Simon’s Hook is a wonderful book about a boy named Simon who get’s teased until Grandma Rose comes along and empowers him to deal with those teasing him. The book provides practical situations on dealing with teasing with funny pictures and dialogue. Age 6+. Nobody is a fun comic, style written book about a boy named Thomas who is being bullied by Kyle at school. Each page has illustrations with dialog about how Thomas feels. I appreciate books that really focus on emotion and how to deal with it. At the end of the book there are discussion questions that challenge the child to determine which character he is most like and what he can do to change the situation. Weird is a beautifully illustrated book about a girl named Luisa being bullied in school. The author takes the reader through various situations that show you how to live with a confident, humble attitude, and the outcome. This book is one of my favorite anti-bullying books for colorful illustrations depicting emotions. It could be useful for many kids who are either the bully victims, friends or the bullies themselves. Age 5-9. Tease Monster is a playful book discussing the differences between teasing and bullying and the different types. The discussions in the book provide opportunities to discuss your own child’s behaviors towards others as well as how your child has treated others. Age 5-12. Books open the dialogue at a young age for children to learn and discuss issues they may face and empower them to stand tall, seek help when needed, and help others in need. These teachable moments can make a difference in their lives and in the lives of others around them. A great resource to kick start a discussion on classroom bullying and using positive solutions to tackle problems is the children’s book, FOR NO REASON (https://www.skippingstonepress.net). In this animated, heart-warming story, Jamie Higgins comes up with a clever way to deal with a classroom bully, Brad Lugsley, without getting into trouble or being mean. She decides to smile…for no reason and eventually gets her whole class smiling…even Brad! At the back of the book, there are fun, creative and educational activities to get children thinking about their own experiences and how they might solve a bullying situation in a positive way. Children are encouraged to use the book’s colourful poster illustrations or come up with their own ideas on creating NO BULLYING posters for their classroom. Amazing collection of activities. The kids will find these vary fascinating. There are many different activities of kids on kidsfront.com.